<!-~~~~~~~~~~~~~~~~~~~~~~~~~~~~~~~~~~~~~~~~~~~~~~~~ 21st Century Designs by: Norm Silliman File created 03/23/06 Last Edited 03/23/06 ~~~~~~~~~~~~~~~~~~~~~~~~~~~~~~~~~~~~~~~~~~~~~~~~~-> Gryoscopic Thrust"
Gryoscopes are like tops but are usually inclosed inside a cage so one can handle the toy while it is spinning. They are know to work as a stabling device. The gyroscope resists "tipping". (Tipping = Tilting) This is the effect that stablizes bicycles. When a gyroscope is supported by both ends (when the wheel is spinning in the virtical plane) and one end support is removed, the toy will hang in space. Everyone marvels at the ability of the gyroscope to "process" around the supported end when the other end is free. I want YOU to marvel at the ability of the gyroscope to "hang in mid-air". The gravitational force of one half the weight of the rotor is the force that is being compensated. This compensating force is what I want to harness. The gyroscopes resistance to "tipping" is an equal force in the opposite direction to the force of the "tipping". And this resistance force is persistent, lasting as long as the "tipping" force is applied. Dr. Hugh Hunt of the University of Cambridge provides us with a real world test that demonstrates the uni-directional force resulting from "tipping" a rotating gyroscope. The pictures and text are from an article in the +Plus Magazine at plus.maths.org.issue7/features/gyroscopes/index.html. Dr. Hunt says "Conservation of angular momentum can easily be observed if you sit on a swivelly chair while holding a spinning cyroscope. The chail is mounted on a pivot so that the chair can rotate about the vertical axis. If you hold the gyroscope so that its axis of rotation is horizontal (so that the spinning disc is in the vertical plane), the gyroscope's angular momentum is in the horizontal plane and there is none in the vertical plane (as in figure to the right). "If you now tilt the gyroscope to the vertical, so that its spinning disc is in the horigontal lane, you have transferred its angular momentum to the vertical plane. Since the net angular momentum in this plane must remaain zero (to conserve angular momentum- it was zero in the this plane when we started) you'll find that you and the chair start spinning to compensate! You will, of course, move in the opposite direction to the spinning disc. If you move the gyroscope back to the original position, your spin will again cease. Turn it vertically the other way, and you'll spin in the other direction. Enough to make anybody dizzy! This is a really fun experiment to do and it works realy well if you're skinny - less than 8 stones and you'll spin really fast!" How to Trigger a Stand-alone Gryoscopic Thrust. Dr. Hunt's demostration shows us that this compensating force (that I want to harness) is real and large enough to be of some value. The compensating force is in the opposite direction to the force of the "tipping". I don't buy the arguement about the conservation of angular momentum. But he shows this resistance force appears to be persistent, lasting as long as the "tipping" force is applied. Now, how do we trigger a Stand-alone Gryoscopic to generate thrust without the aid of a person holding the gyroscope? The GOLD STANDARD of evidence to demonstrate a device is indeed producing an unbalanced thrust is to hang the device on a teather. 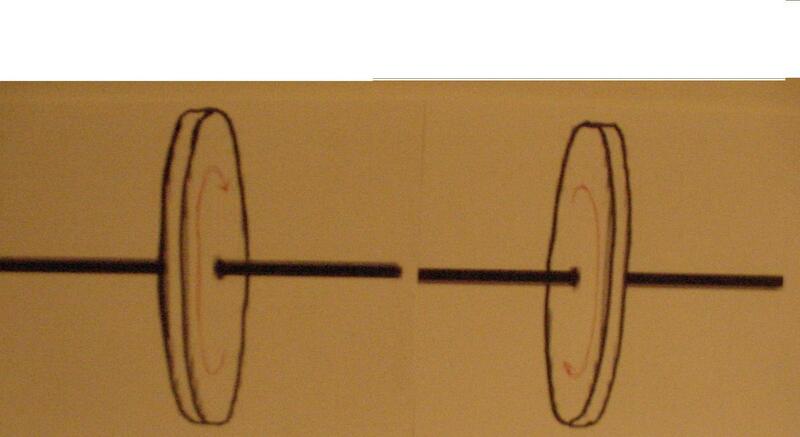 If the running device pushes off to oneside, AND stays at least part way up the arc, resisting the force of gravity, then the device is a candidate for consideration. 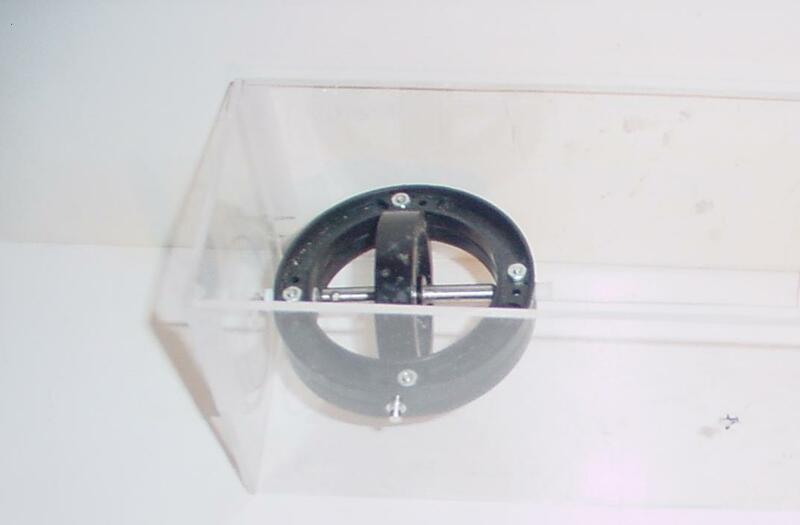 If we put the gryoscope in a box (that we can hang from the ceiling), and push the frame of the gyroscope with an actuator attached to the box, the only effect we get is to rotate the BOX. The gyroscope resists "tipping" remember. How to Build a Gryoscopic Thrust Toy. 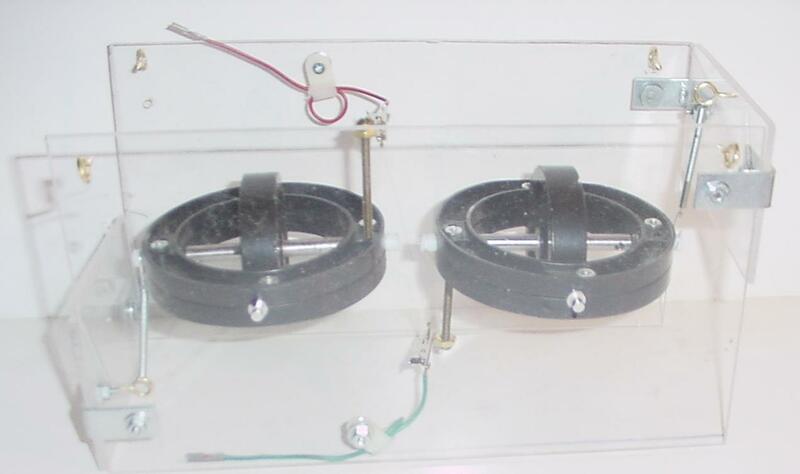 Since a gyroscope resists being pushed, how about two gyroscopes, running in opposite directions, one pushing the other, and the second pushing the first. This arrangement removes the dependance of using the box for a point of leverage. This makes the device "frame-of-reference independent". And, this arrangement gives us twice the thrust of a single gyroscope, but with twice the weight of with the extra gryo. This is what the gyro-thruster toy box side view looks like when all the construction is finished, showing the hook eyes (at the corners) for attaching the support cords, for the pendulum test. That was what I thought the theory said would work. Well, I missed two critical points. Gyroscopes weakly react to tipping when the gyroscope is tipped on the radius axis. They react much more strongly when the tipping is on the diameter axis. Which is good, else steering of bicycles would be very difficult. There has be very little activity on most of these web-sites, but they will show you what happened in the past.